By D Magazine | 11 years ago As the owner of Walter Lee Culp, Kelly Hardage’s days are spent amid a cacophony of design styles, colors, and patterns. But at home, surrounded by neutrals and clean lines, the clatter of the day is left behind. By D Magazine | 11 years ago Designers Martha Sweezey and Katie Collins transform a big-box builder’s home into an airy French retreat. 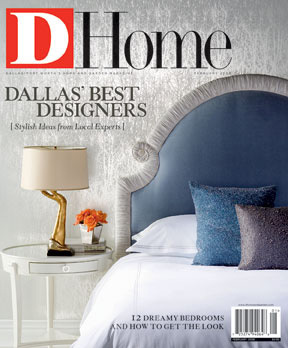 By D Magazine | 11 years ago These 62 local designers were voted the best in Dallas by their peers. By Christine Lieb | 11 years ago Alessi Dallas specializes in the sleek and sublime. By Mary Candace Evans | 11 years ago Gabriel Barbier-Mueller is converting a former warehouse district on the edge of Uptown into a stylish European-inspired neighborhood. By Amanda Tackett | 11 years ago She’s the Norma Desmond of houses. Once glamorous and vital, she’s now faded and glum. I’m bringing her back to life brick by brick. By D Magazine | 11 years ago Add a spark of the celestial with these futuristic finds. By D Magazine | 11 years ago Matched pairs of Murano lamps from the 1930s to the 1960s are especially rare, and some are by master glass artisans Seguso, Venini, Barovier & Toso. By D Magazine | 11 years ago A modern stunner, this winter white bookcase by MDF Italia is anything but typical. By Laura Kostelny | 11 years ago A red-hot chair at Scott + Cooner. By Rebecca Sherman | 11 years ago Self Portrait: What your collections say about you. 2801 Turtle Creek Blvd., No. 6W, The Mansion Residences. $5,500,000. By D Magazine | 11 years ago ProSun not only gives you a tan—it also irons out your wrinkles. By D Magazine | 11 years ago Most guys Chris Wiesinger’s age collect girls’ phone numbers. Wiesinger collects indigenous blooms. And he wouldn’t have it any other way. By D Magazine | 11 years ago Twelve dreamy bedrooms and how to get the look. By Peggy Levinson | 11 years ago Archived designs by Fortuny, Donghia classics revisited, luxury textiles "to go" at Allan Knight, and East & Orient rocks out.